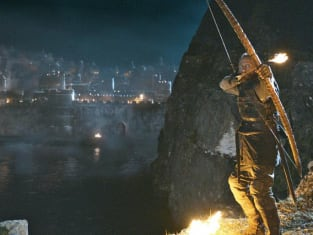 Game of Thrones delivered its best episode of Season 2 last Sunday, as the battle of Blackwater left many dead and raised many questions heading into the upcoming season finale. Matt: Tyrion and Shae in bed. As I mentioned in my review, the scene was symbolic of just haw far Tyrion has come. When he met Sansa, he was just looking for a hot piece before possibly going off to die in battle. Here, he was fully in love with that hot piece... before possibly going off to die in battle. Dan: Because I had absolutely no idea how the battle was going to begin, and had forgotten about the barrels upon barrels of Ninja Turtle Ooze Tyrian had, I have to go with the early destruction of Team Stannis. It was magnificent to watch. Carissa: I loved every moment of Cersei and Sansa interacting. That Cersei was a woman, and stuck in the castle, it all came together for me how useless she must feel as a queen without a real king - or even her brother - at her side. Carla: This is a tough one. There were quite a few brilliant scenes. Tyrion stepping up for the deserter Joffrey was heartening to watch unfold. His bravery and leadership is what Westeros needs to survive. Unfortunately, I expect that he won't get any credit for the victory. Should Sansa leave with Hound? Matt: Hmmm... she gets beaten by her fiance's guards in King's Landing and also nearly raped. Her life there would consist of nothing but pushing out children for the most violent king since Kong, so, yes, I'm gonna say she's better off anywhere else. Dan: Absolutely. Every single time calls her dove, she should be closer and closer to enjoying his company. Carissa: Sansa should leave with the Hound, but she is still frightened of him, and should be. Despite his affection for her, she would be running from the fire into the frying pan. No place is really safe for her at this point. It's best to stay where she still has at least some allies. Carla: Yes, definitely. Though I'm not sure she will get out in time. Ned tried to get his daughters out of King's Landing before Joffrey took over the throne unsuccessfully and I expect that will happen again here. Besides, she needs to stay to kill Joffrey. I really hope she is the one that kills him! Rank Tyrion's battle speech among the all-time most inspiring. Matt: It was no Gene Hackman in Hoosiers. It didn't end with Tyrion telling his team he loves them or with any kind of slow clap. But that's a lofty standard by which to judge. I would have been inspired to fight against Stannis at least. Dan: It was great, but because Tyrion is who he is, I don't think it was supposed to be all-time great. He's not in the pantheon yet, but he's getting there. Bill Pullman he was not. Carla: It was up there as one of the best. Not quite as inspiring as the presidential speeches in American President or Independence Day. They are still are at the top of my list. Carissa: It was pretty good, but I liked Carla and Dan's choices a lot, too. Especially Independence Day. That one always brings me to tears. More surprising: Cersei nearly poisoning her son; Joffrey abandoning the fight; or Tywin coming to the rescue? Matt: Joffrey, no doubt. I had him pegged as a fearless leader of men who would sacrifice anything for the safety of his kingdom. Dan: Tywin was the only surprising factor. In fact, I was also a bit confused by his apparent victory. Carissa: I'll go with Tywin. I can completely see why Cersei would want to poison her son and had no doubt Joffrey would run given the chance. It seemed that Tywin came out of nowhere, so for his magical, dancing troops I give him props! Carla: Cersei is crazy so nothing she does really surprises me. And the almost-poisoning makes sense upon reflection. Joffrey is a wuss. I'm surprised he lasted as long as he did close to the fighting. Tywin coming in was a surprise since we were lead to believe he was off fighting Robb. It was a pleasant surprise. As much as I hate Joffrey, I didn't want Stannis on the Iron Throne. Matt: Brienne will hook up with Jaime Lannister. Dan: The Smoke Baby will take the form of Jon Snow, make his way back to the other side of the wall, attempt to kill everyone in Westeros and finally be murdered by Jack Shephard... oops, wrong show. Carissa: Tywin will admit he knew who Arya was and tell Cersei they still have both Stark daughters as prisoners. Carla: I really have no clue what is going to happen. It's not a bold prediction, but I'd love for Joffrey to die in the finale. A horrible death.